When speed and reliability are everything, shoot like a pro with SanDisk Extreme Pro SDHC UHS-I memory cards. New Power Core Controller technology provides faster shot-to-shot performance (up to 45 MB/s) and its advanced Error Correction Code (ECC) engine improves overall data integrity and reliability of the card during read and write. So when the unexpected happens-you'll be ready. Get more RAW + JPEG continuous burst mode shooting and capture full HD video (UHS Speed Class 1) like never before. Reliable. Durable. 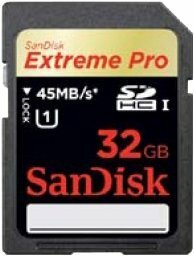 When every shot counts, choose SanDisk Extreme Pro SDHC UHS-I memory cards for your DSLR or HD camcorder.